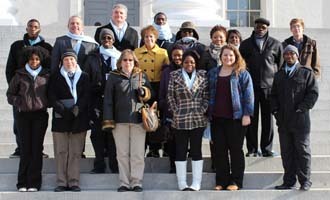 Thirteen Tidewater Community College students clambered aboard a bus before 6 a.m. on a chilly February morning for a trip to the Capitol in Richmond. Despite the freezing temperatures, students were all smiles – excited to visit the General Assembly and share their community college stories. The Virginia Community College’s “Legislative Days” event offers students the opportunity to talk with delegates and senators in Richmond and explain how community college has shaped their dreams. From there, students made their way to the General Assembly Building for appointments with Del. S. Chris Jones (R-Chesapeake), Del. James Leftwich Jr. (R-Chesapeake), Del. Lionell Spruill Sr. (D-Chesapeake) and Sen. John Cosgrove (R-Chesapeake). Del. James Leftwich with TCC students. Student Hezroy Hammil, a computer science major, extended his gratitude to Cosgrove for his continued support of community colleges and asked him for future support of a STEM building on Chesapeake’s campus. As the only engineer in the Senate, Cosgrove was eager to voice his enthusiasm, which Hammil appreciated. “Without you and the work you do here, higher ed would not have been accessible to me,” he said. The final activity of the day was a Capitol tour led by Jim Hines, a TCC staff member and history buff. Hines led students through the building – touring the gallery outside the governor’s office, pointing out historically significant sculptures and walking through the old Virginia House of Delegates and Senate rooms.